I’ve been on a real salad kick lately. Mostly because I’d been working on my #pizzadiet (that’s pizza all day errday forever). I realized that while delicious, it’s not actually really that good for you. WHO KNEW? I made one of my go-to favorites, the Zesty Taco Salad, earlier in the week. 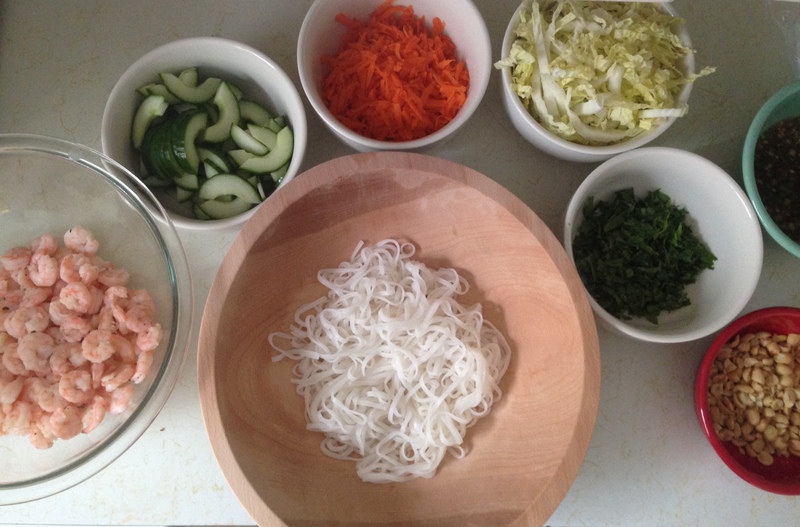 But then I saw my buddies at Food52 post this link to the Vietnamese Rice Noodle Salad and I knew I had to make it. Just to be clear, I’m not actually buddies with the people at Food52. But, I pretend we’re friends since I follow them on Instagram and Facebook and love almost everything they do. Frankly, I’m better friends with them than some people I’m actually friends with on FB. Anywho. This salad was so enticing that my friend Emily and I ran into each other at the store shopping for supplies (“I’m looking for napa cabbage.” “I’M looking for napa cabbage.” “Wait, what are you making…?”) After going to two stores to find the previously aforementioned napa cabbage, we both finally were able to make dinner. And to quote Emily again, it was pretty damn delicious. If you have everything on hand, this is not only pretty damn delicious, but it’s a quick meal to assemble. It’s a meal that can be put together in the time it takes to boil water. Author’s note: this will happen much more quickly if you do not watch the pot. 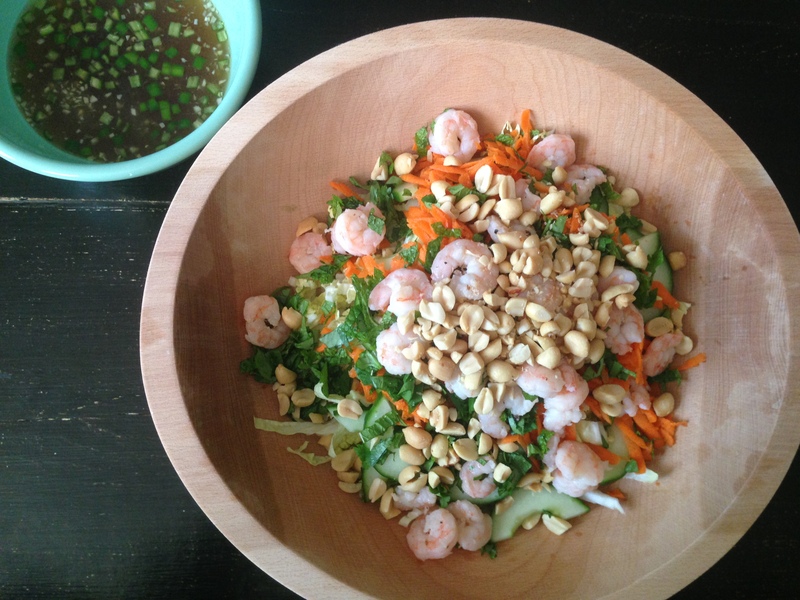 This salad tastes like summer. It’s fresh and crisp, and with the dressing, sweet and spicy. There’s a ton of textures at play here, too. Rice noodles with just a bit of bite, crunchy cucumbers and cabbage, and plump shrimps. Is it as good as pizza? But, it’s a pretty damn delicious meal. 1 fresh Thai (or bird’s eye) chile, minced | I couldn’t find one, so I used a serrano chile. Worked well! One of my loyal readers sent some fan mail with a question to the My Fake Food Blog Fan Club. Since I am so benevolent, I won’t disappoint the public. I HAVE to post for Micheal. I like soup forever and always. I like soup in the fall, winter, spring and yes, even the summer. 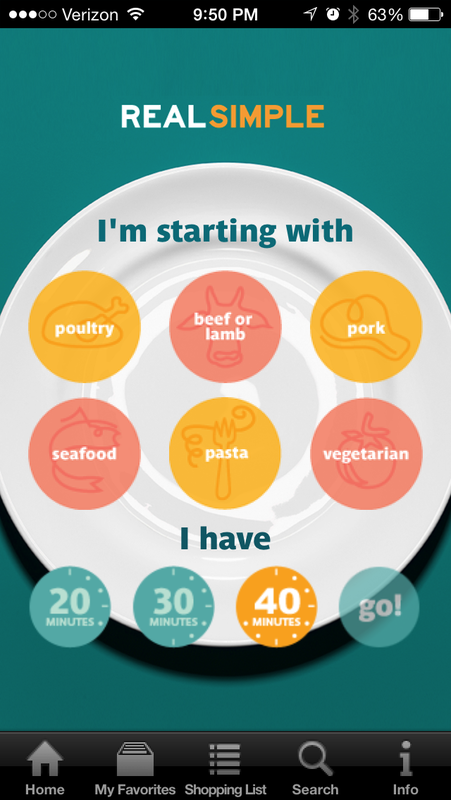 I’ve had the Real Simple No Time to Cook app for a long time, but hardly use it. But I was bored with my usual sites for cooking inspiration and I remembered why I downloaded it in the first place. The app looks like this. Just plug in what main ingredient you have and how much time you have and at your fingertips is a list of quick meal ideas. 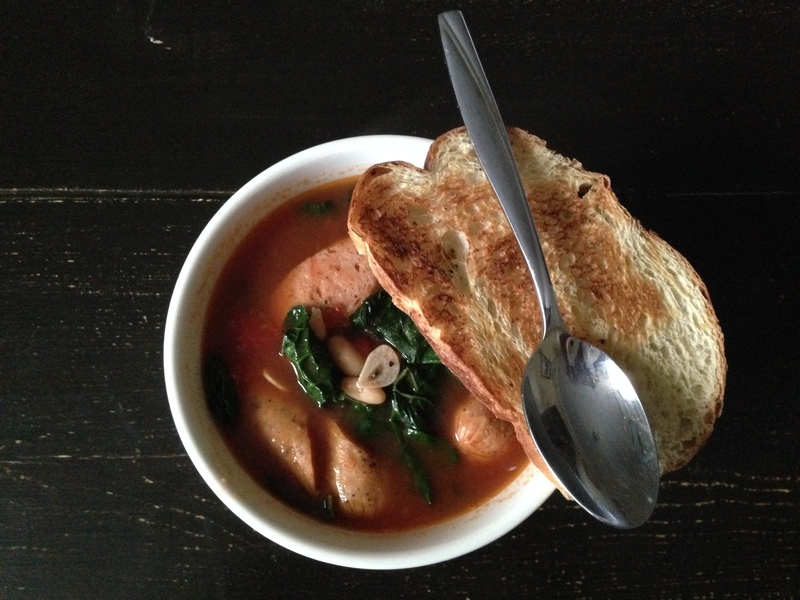 With no ingredients in the house, I plugged in poultry and 20 minutes and came across this recipe for Bean and Chicken Sausage Stew. And then I went shopping for stew ingredients on an 80+ degree day. But, it’s the kind of thing that you can eat all year long. The broth is light, but this stew is full of delicious, and frankly, healthy stuff. It has tons of kale, which is full of vitamins or whatever. (Actually, kale has calcium and vitamins A, C and K, according to WebMD.) White beans have a ton of protein and fiber. And bread has delicious, delicious carbs. One thing to note about this recipe is it requires extra salt. Hardly any is called for and as we all know, food needs salt. Like Matt Saracen needs Julie, like Coach needs Mrs. Coach, like Jason Street needs his wheelchair (#spoileralert), this stew needs salt. So, loyal readers, please. Go forth and make this stew. And download the Real Simple app. And be sure to write in your questions, comments, compliments whenever you have them. My assistant will be happy to answer each and every one of them, just as soon as he’s done drawing my bath. Heat the oil in a large saucepan or Dutch oven over medium heat. Add the sausage and cook, stirring once, until browned, 2 to 3 minutes. Stir in the garlic and cook for 2 minutes more. Add the beans, broth, and tomatoes and their liquid and bring to a boil. Add the kale and ¼ teaspoon each salt and pepper. Simmer, stirring occasionally, until wilted, 2 to 3 minutes. Taste for seasoning and adjust. Serve with the bread, if using. …I hate to say this to you guys…but summer is almost over. Ok, I get it, Lady Mary. You are cold and hard but you are also capable of love but most of all you DO NOT WANT TO TALK ABOUT SUMMER ENDING. Let me tell you what. This is an almost no cook salad. And it’s full of fresh veggies and packed with citrus-y zing (yes, I did type that). I don’t mean to brag here. But I took this to a potluck and someone else had brought a black bean salad too. My friend who threw the potluck said that my salad was full of much more flavor than the other salad. 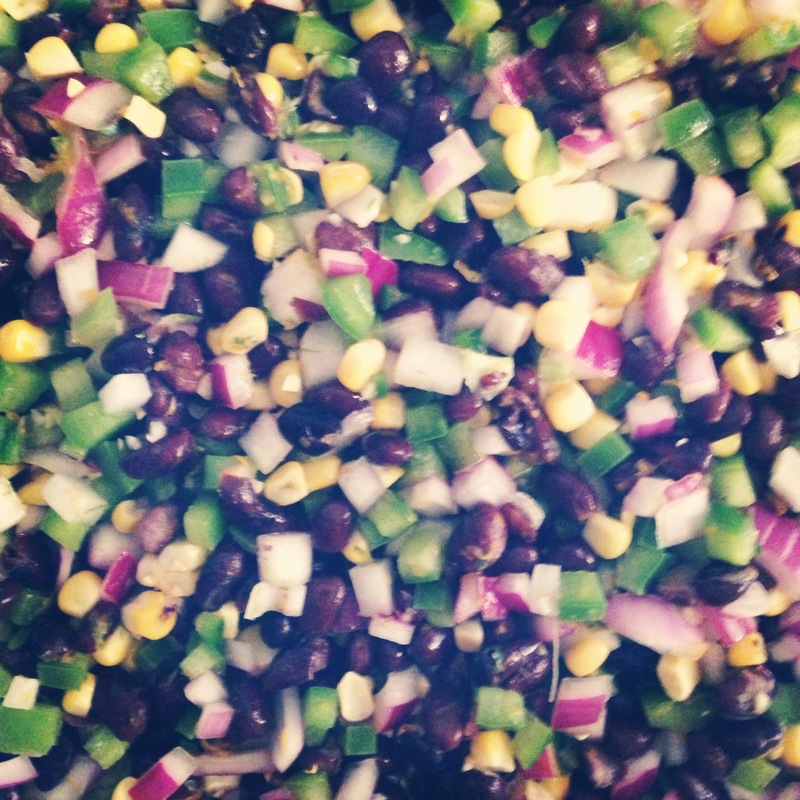 In a black bean salad walk off, this salad will always win, Billy Zane. 1 fresh corn, grilled, shucked and cut off cob | I grilled the corn because a friend of mine told me that raw corn is rough on your digestive system. (YIKES) Grilling it kept the integrity of the kernels by not making them mushy. 1-2 watermelon radishes, peeled and small diced | I used boring regular radishes. In a large bowl, combine all ingredients, tossing to coat well. Season with salt to taste. It’s that easy.